A Legendary Event was honored and proud to have been selected as the special events company to cater and design The Presidential Campaign Dinner. 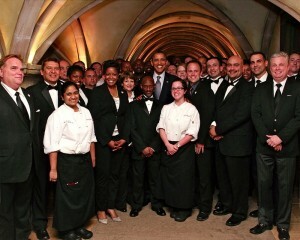 President Obama joins Founder and CEO Tony Conway and the dedicated team and staff of A Legendary Event. This entry was posted in Uncategorized and tagged President Obama, Presidential Campaign Dinner. Bookmark the permalink.